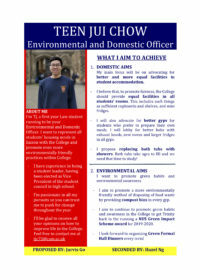 Elections will happen on Friday 1st February, from 10 a.m. till 10 p.m. on the CUSU voting website. * Results will be announced in the bar a few minutes after the close of polls. 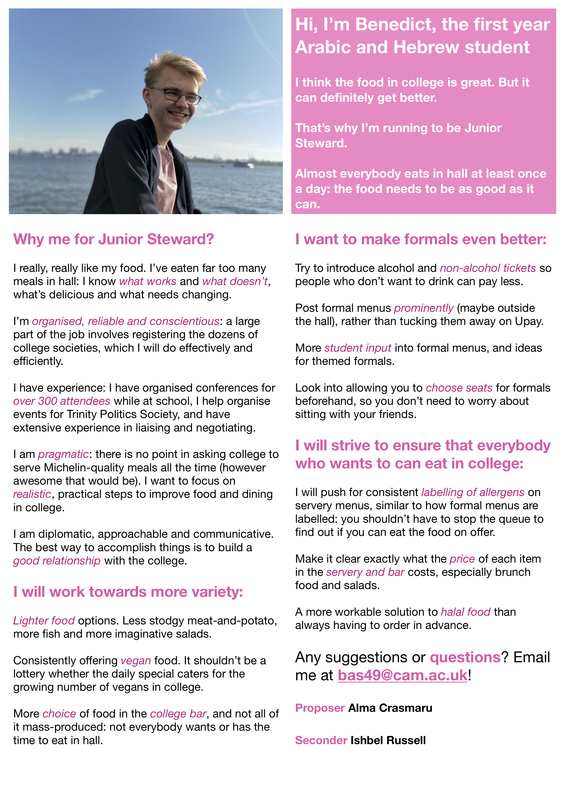 Below are the candidates’ manifestos (where roles are contested they show up in alphabetical order). 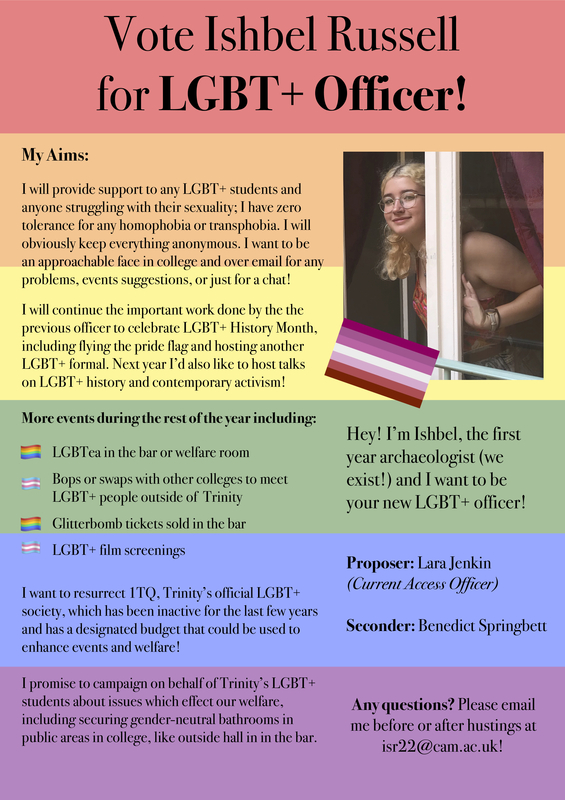 *We’d like to remind students that as of Schedule 1.12 of the TCSU Constitution in electing the Welfare Officers, only those self-identifying as women or non-binary, BME, LGBT+, etc. 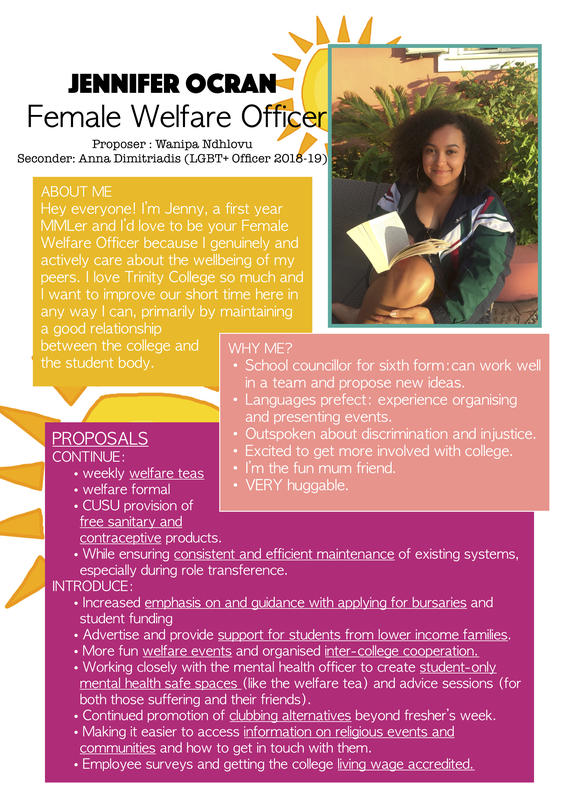 may vote for Women’s Officer, BME, LGBT+ Officer, etc. respectively. 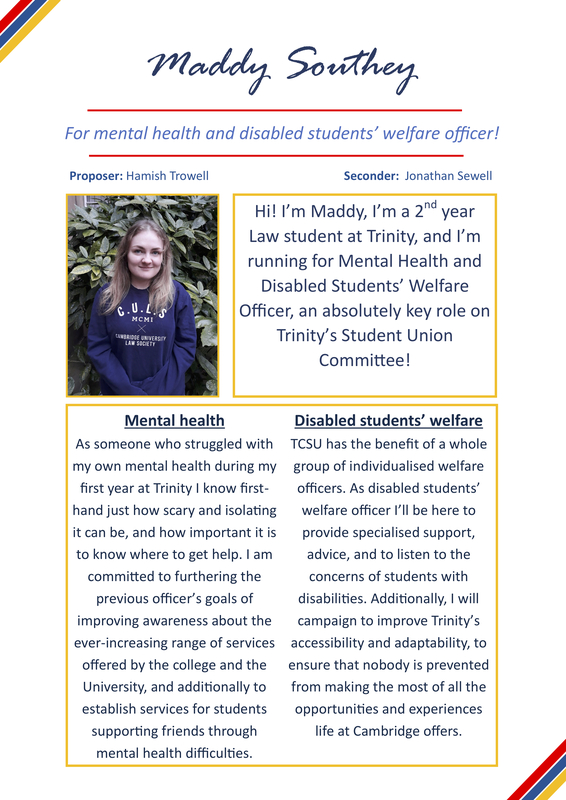 The exception to this is the Mental Health and Disabled Students’ Welfare Officer; everybody is be entitled to vote for this role. 1. The Committee acts in accordance with the constitution. 2. All members of the Committee perform the duties of their post. 3. Policy from Open Meetings is enacted. 4. 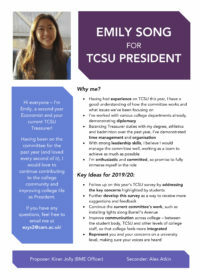 They shall represent TCSU at CUSU Council. The Vice-President shall act as immediate deputy to the President. If at any stage the President is absent, the Vice-President shall take over as Acting President. The Vice-President shall act as an intermediary between the President and the rest of the Committee in the matter of grievances about the way in which the business of the Committee is being conducted. The Vice- President shall act with the President to remind the Committee members of their duties. 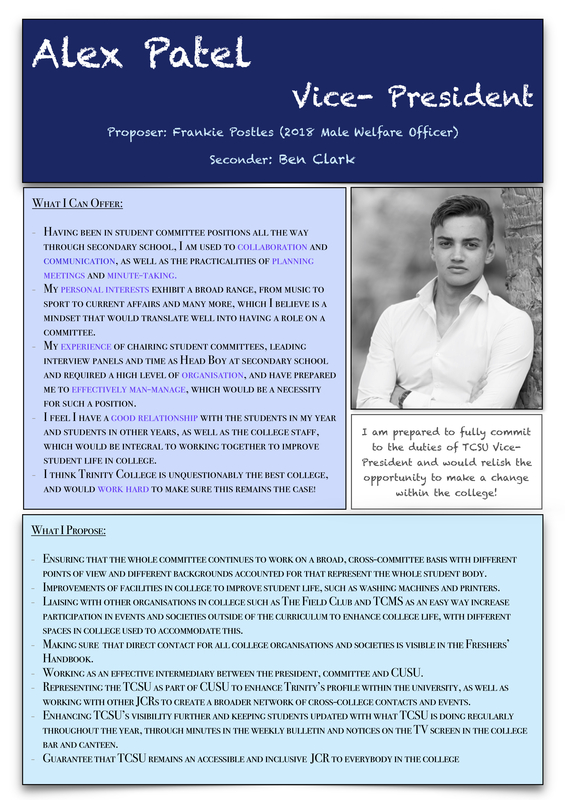 The Vice-President shall act as the main channel of communication between TCSU and CUSU, NUS, and other bodies outside the College. 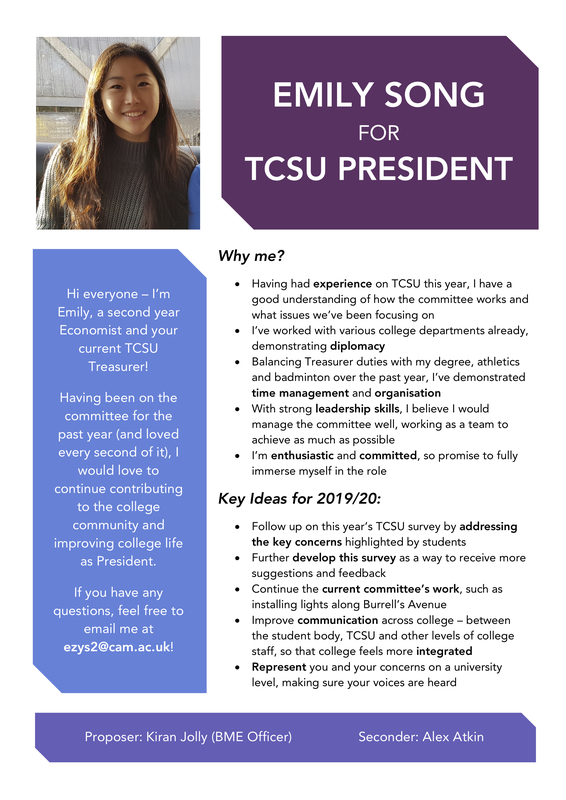 They shall represent TCSU at CUSU Council, act as CUSU representative at Open Meetings in the absence of a member of the CUSU Executive, and act as returning officer in College for CUSU elections. 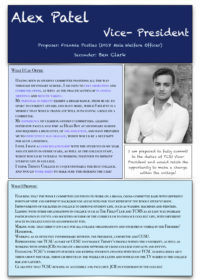 They shall publicise CUSU and NUS activities, and organise the distribution of material received from these bodies. Moreover, The Vice-President shall have responsibilities consistent with the constitution for setting agendas, taking and distributing minutes and booking rooms for all Committee, Open and Liaison meetings. 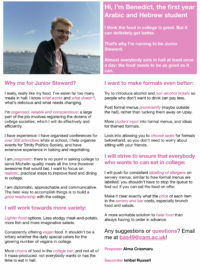 The Vice-President shall have responsibility of the Freshers’ Handbook. 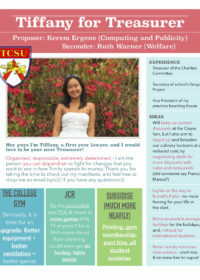 The Treasurer has responsibilities outlined in Schedule 4 of the TCSU Constitution. 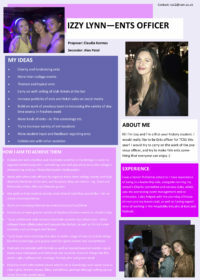 The Entertainments Officer shall be responsible for the smooth running of all TCSU entertainment events and the maintenance and usage of all property of TCSU used for entertainment purposes. 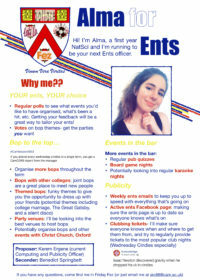 The Ents Officer will be responsible for advertising and publicising any TCSU entertainments. 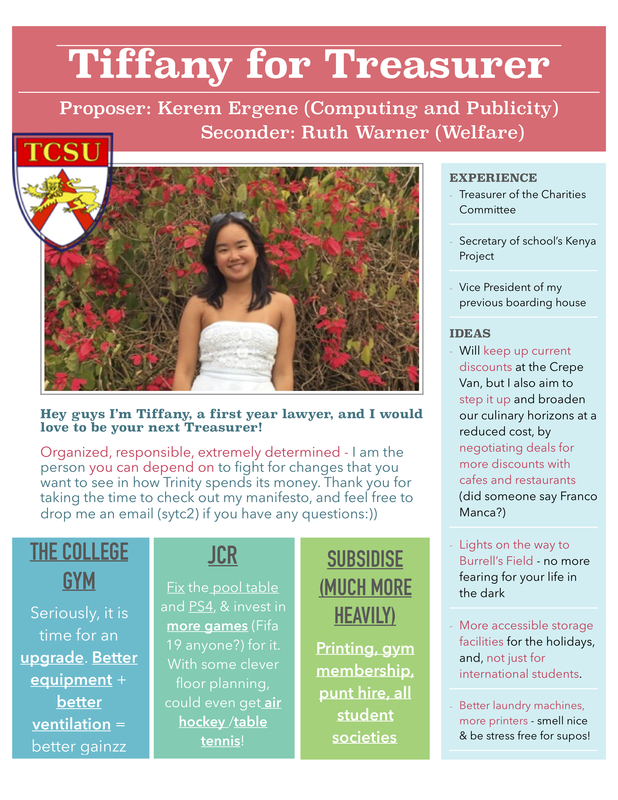 The Computing and Publicity Officer shall be responsible for the maintenance of the TCSU website, management of TCSU Social Media and College-wide e-mail lists, as well as photographic coverage of TCSU events. They shall be responsible for uploading TCSU Executive and Open Meeting Minutes within 48hrs of their completion. They shall ensure that the TCSU Website contains up to date contact details, termly reports and a digital copy of the constitution. In addition, they shall be a member of the College Computing Committee. 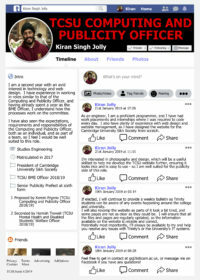 They will also be responsible for adding incoming Freshers to the TCSU Mailing List and setting up a separate one for Freshers if necessary. 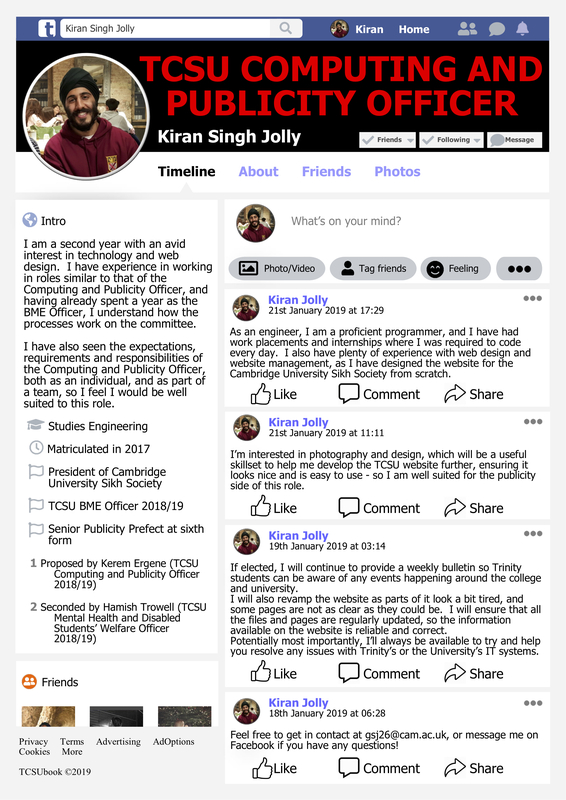 As Publicity officer they shall communicate with students, societies or organisations requesting TCSU Publicity and with the College Communications Officer. They shall recruit a Publicity Sub- Committee, whose responsibility it shall be to take pictures at TCSU events and draw informative graphics about events on the noticeboard by the servery. 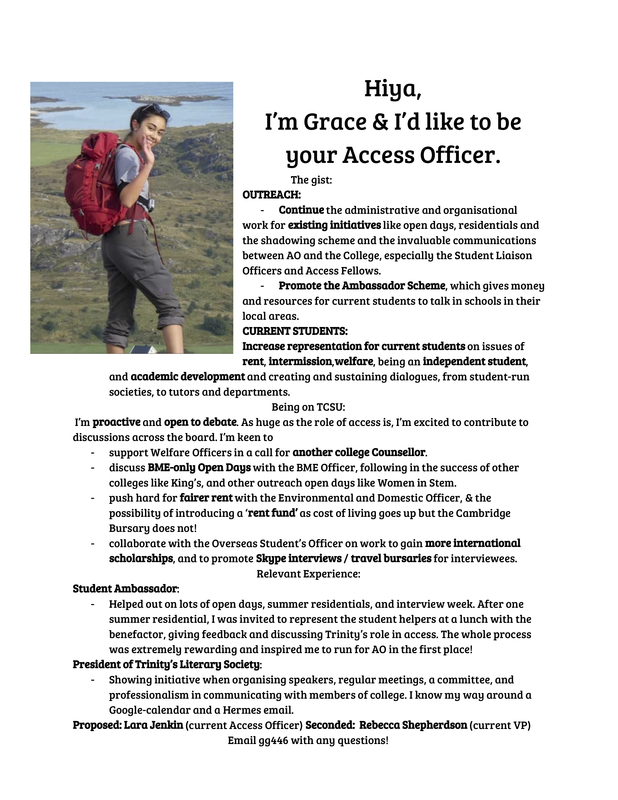 The Access Officer shall be responsible for co-ordinating TCSU participation in all College and university-wide Access projects. The Access Officer will recruit and run an Access Sub-Committee. They shall be a member of the Access Committee. 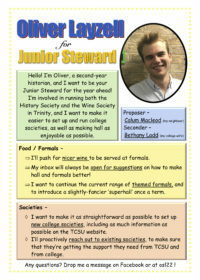 The Junior Steward shall be responsible for liaison with the Catering Department. They shall act as Secretary and TCSU representative to the College Food Committee. They shall have responsibility for the implementation of Schedule 2 of the TCSU Constitution and maintain a list of contact details for all Trinity-recognised societies. 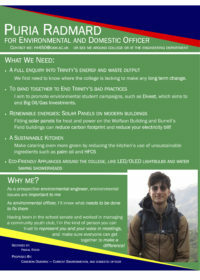 The Environmental and Domestic Officer shall represent TCSU members’ housing needs in liaison with College authorities and advocate for more sustainable practices around College. 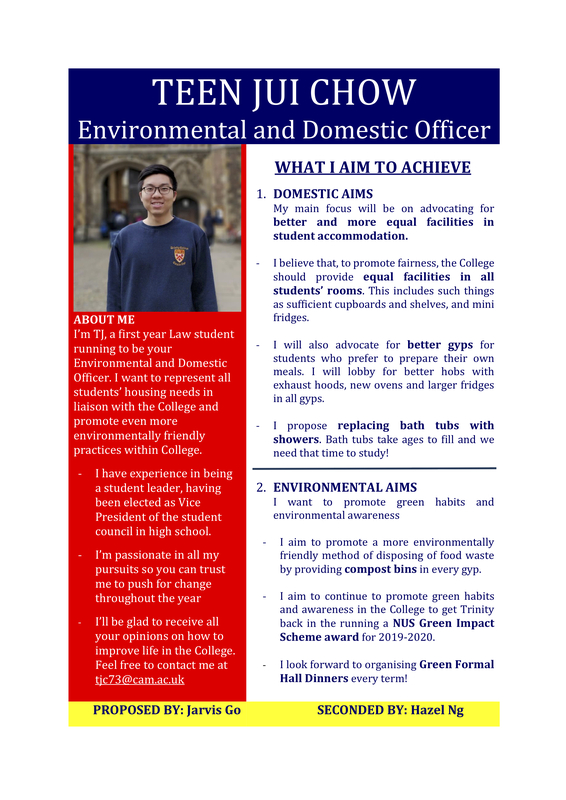 They will take responsibility for promoting environmentally friendly habits and environmental awareness, as well as liaising with university-wide environmental campaigns. 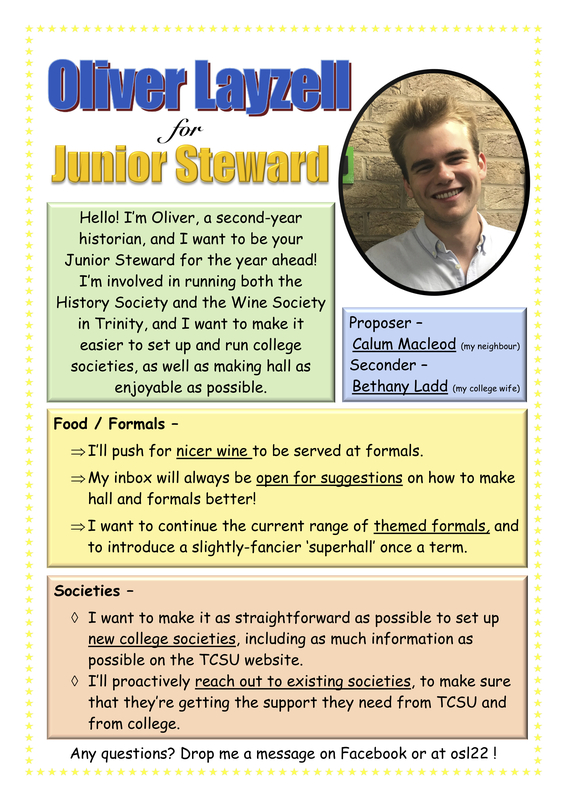 They shall organise a ‘Green Formal Hall Dinner’ twice a year, once in Michaelmas and once in Lent term. 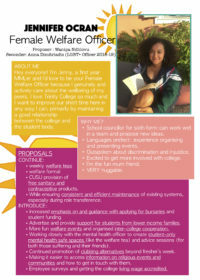 The Female and Male Welfare Officers shall provide pastoral support and coordinate welfare events for all TCSU members. They shall represent their welfare and equal opportunities needs in liaison with College authorities. 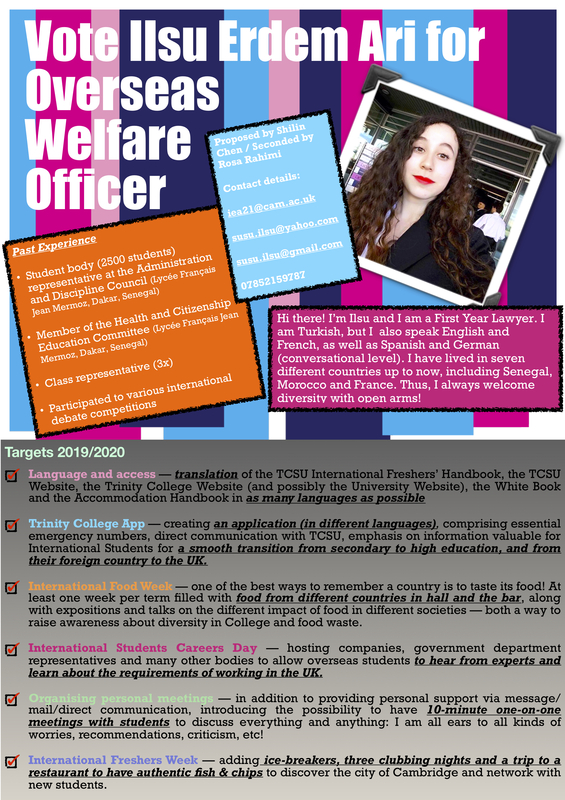 They shall liaise with the CUSU Welfare team. The Female and Male Welfare Officers will manage the College Families Scheme and the Academic Contacts scheme. 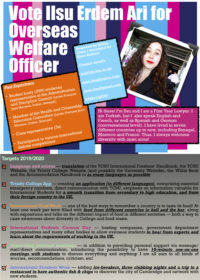 The Welfare Officers shall be responsible for advertising and promoting any TCSU welfare events. 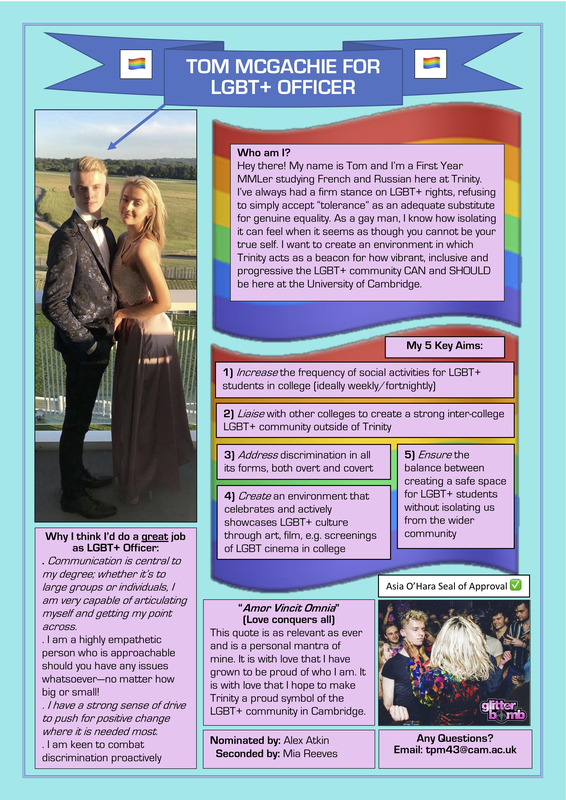 * In light of the Michaelmas 2017 TCSU Open Meeting, non-binary students are eligible to run for election and vote for this role, in addition to any others they are eligible for according to items 7 and 12 respectively of Schedule 1 of the TCSU Constitution. 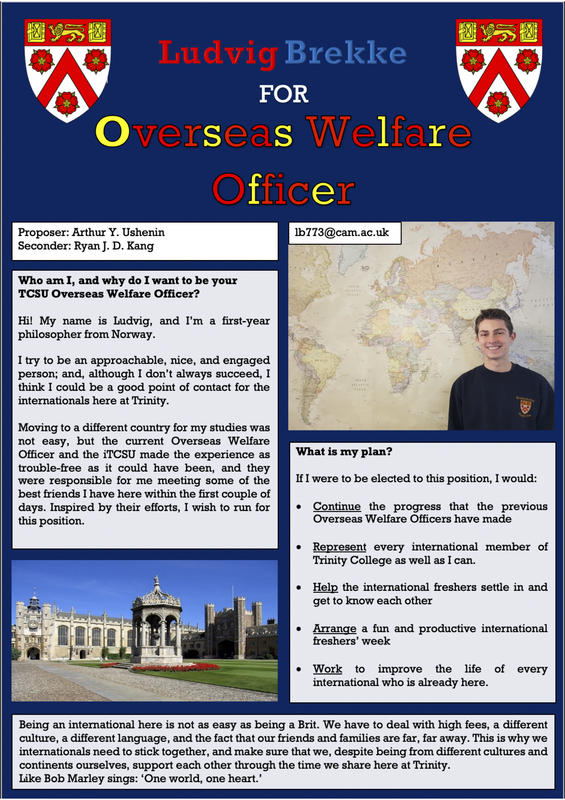 The Overseas’ Welfare Officer shall provide pastoral support and represent the needs of overseas members of TCSU in the committee and with College authorities. 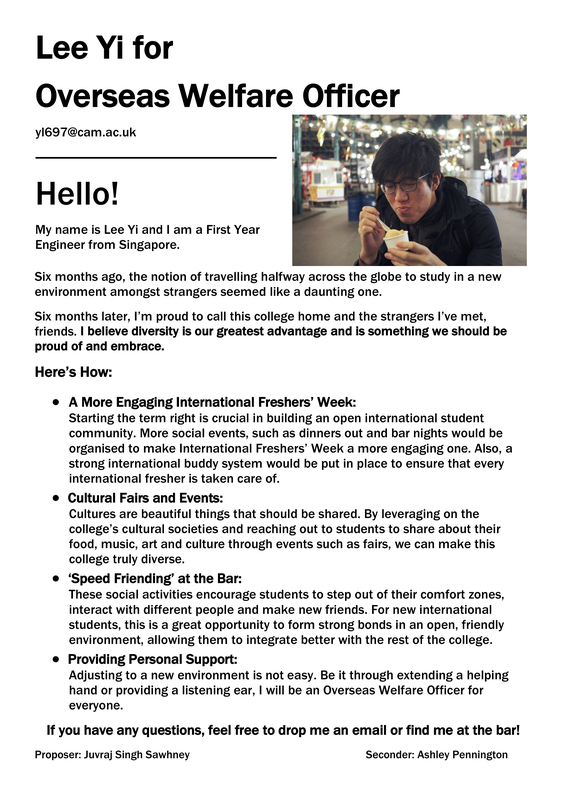 They shall be responsible for organising international Freshers’ Week the producing an International Freshers’ Guide. 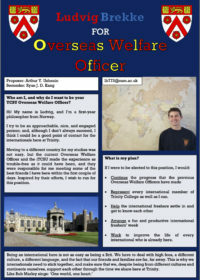 To help with the latter responsibilities, they shall recruit an overseas students’ sub-committee by the name of iTCSU. 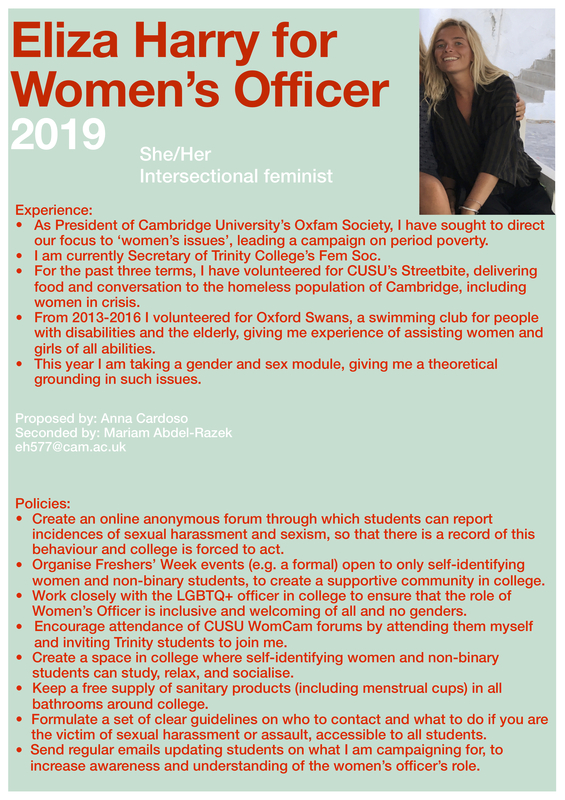 The Women’s Officer shall provide pastoral support and advocate against all forms of discrimination or harassment against women (students and staff) in College. 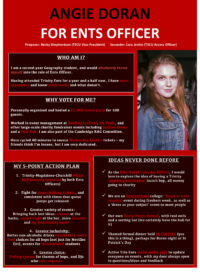 She shall coordinate campaigns in liaison with CUSU’s Women’s campaign and the Trinity Feminism Society. 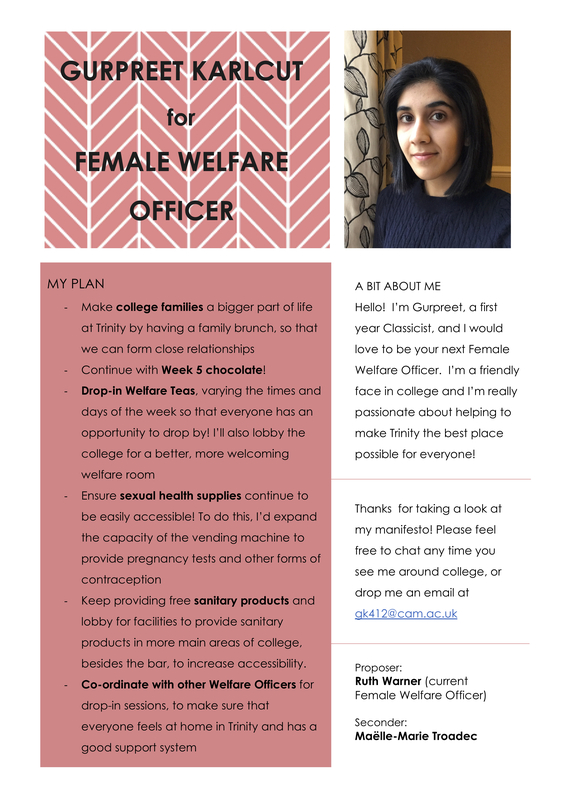 She shall be responsible for distributing female hygiene products. 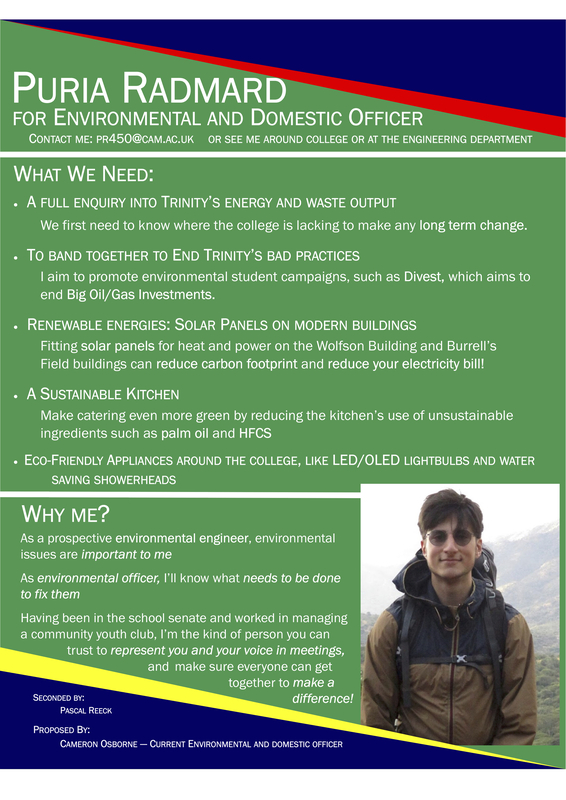 * In light of the Michaelmas TCSU Open Meeting, non-binary students are eligible to run for election and vote for this role, in addition to any others they are eligible for according to items 7 and 12 respectively of Schedule 1 of the TCSU Constitution. 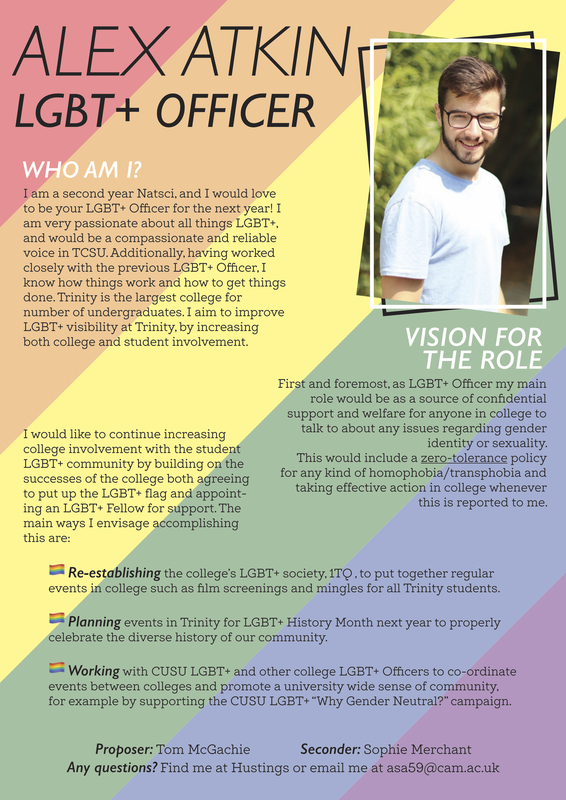 The LGBT+ Officer shall provide pastoral support and represent the needs of LGBT+ members of TCSU in liaison with College authorities and 1TQ. 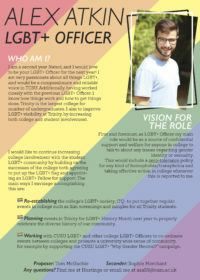 They shall liaise with the CSU LGBT+ campaign and make relevant information available through the TCSU website. 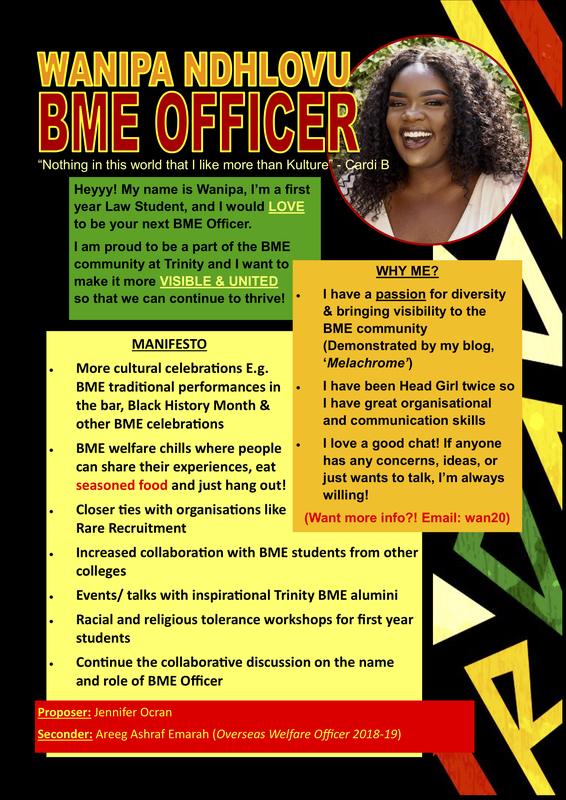 The Black and Minority Ethnic (BME) Officer shall provide pastoral support and advocate against all forms of discrimination or harassment against students on the basis of their race or ethnicity. 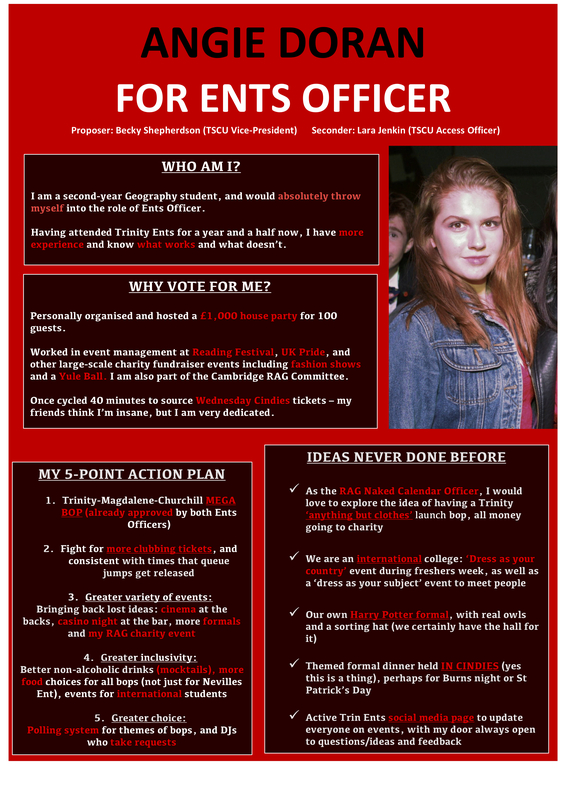 They shall coordinate campaigns in liaison with CUSU’s BME campaign. 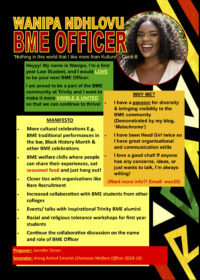 They shall organise an Annual BME Access conference in liaison with TCSU and College Access Officers. They shall be member of the Equal Access Committee. 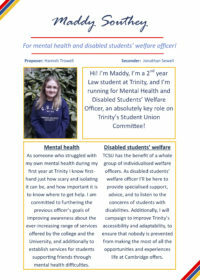 The Mental Health and Disabled Students’ Welfare Officer shall provide pastoral support and represent the needs of disabled members of TCSU in liaison with College authorities. They will liaise with the Disability Resource Centre and will make relevant information available through the TCSU website. They shall co-ordinate Mental Health Campaigns in liaison with the College Counsellor and the College’s Mental Health Advisor. They shall be responsible for publicising the availability of Mental Health advice around Cambridge and for campaigns to normalise Mental Health as a student issue.